This review of literature aims to discuss various properties of zirconia like osseointegration, biocompatibility, and less bacterial colonization, which make it a biomaterial suitable to be used as dental implant, and tries to find out whether the researches done till date authenticate its use. Literature search was done from 1975 to 2015 in PubMed database regarding mechanical properties, osseointegration, biocompatibility, soft tissue response, and antibacterial adhesion properties of zirconia. Literature search was only limited to English language articles. Keywords used in literature search were Zirconia Dental Implant, Zirconia AND Osseointegration, Zirconia AND soft tissue response, Zirconia AND Biocompatibility. Abstract were screened and full texts of potentially eligible articles were obtained. All articles on surface coating of zirconia on implant surfaces, are excluded from the review. A total of 45 papers met the inclusion criteria for the review. All of these papers included in-vitro studies, in-vivo studies and case reports. Results of the literature search were discussed under different sections. Yttria-stabilized tetragonal zirconia polycrystalline (Y-TZP) materials exhibit superior corrosion and wear resistance, as well as a high flexural strength (800-1000 MPa) compared to other dental ceramics ,,, [Table 1]. It was also found that flexural strength of zirconia increases by mechanical modification of its surface. When the compressive strength of blade type of zirconia implants was tested, it was found to be adequate in occlusion . Fracture strength (512.9 N) of unloaded zirconia was found to be more than the fracture strength (401.7 N) of loaded zirconia  [Table 1]. A study performed by Kohal et al. 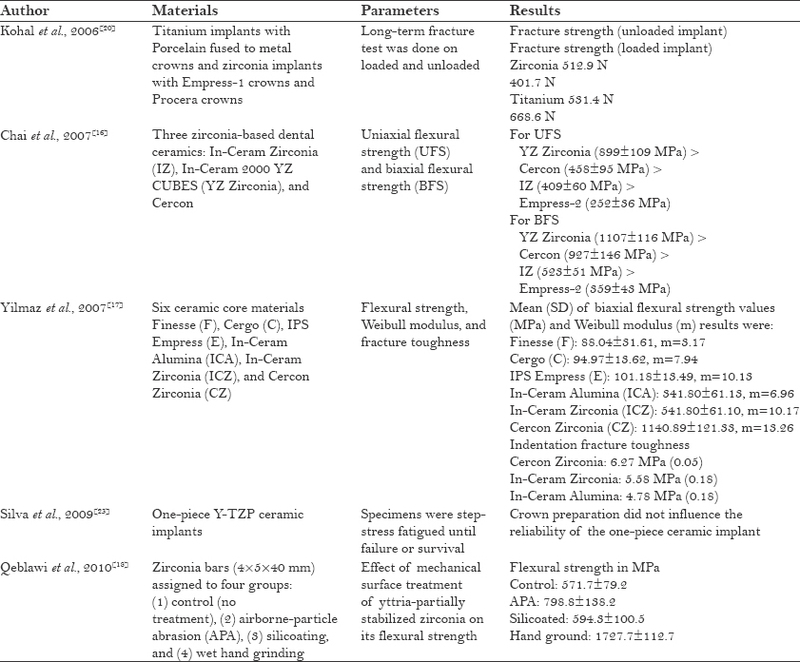 found low fracture strength of two-piece zirconia implants in both loaded and unloaded conditions, due to which they were not recommended for clinical use  [Table 1]. It was also found that the implant preparation and cyclic loading decrease the fracture strength of one-piece zirconia implants, but these values were still within clinically acceptable limits to withstand average occlusal forces even after an extended interval of artificial loading. Whereas Silva et al. reported in their study that crown preparation had no influence on the reliability of one-piece ceramic implant  [Table 1]. One of the most important criteria for the success of implant treatment is osseointegration. Bone apposition takes place on different types of implant surfaces and depends on surface roughness of the implant. , Studies have shown that zirconia coating on the surface of titanium implants favours bone apposition, , which was found to be more than that of titanium implants with no coating. Akagawa et al., in their study, found no significant difference in bone implant contact (BIC) between the loaded and unloaded zirconia implants. The BIC was 81.9% for the unloaded group and 69.8% for the loaded group  [Table 2]. Another study which examined the role of osseointegration around one-stage zirconia screw implant under various conditions for loading showed no difference in bone contact ratio among the single freestanding, connected freestanding, and implant-tooth supports of partially stabilized zirconia implants. 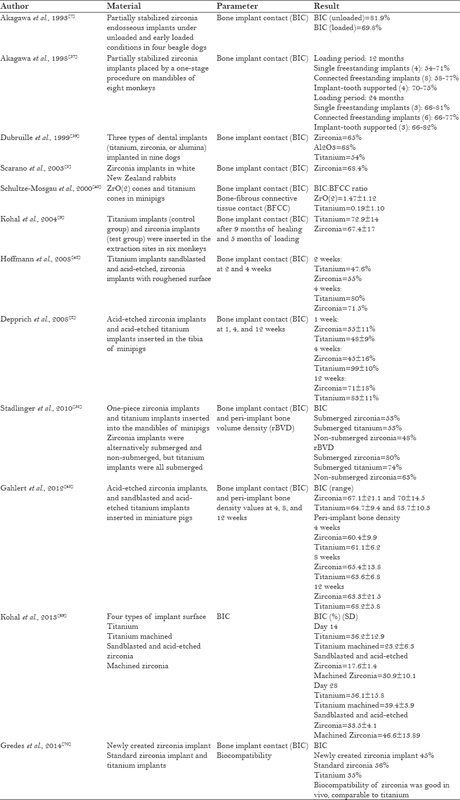 These findings were in agreement with another study which compared the BIC of submerged zirconia and non-submerged zirconia implants with submerged titanium as the control  [Table 2]. Similar rate of bone apposition on zirconia and surface-modified titanium implant surfaces during early healing was found when a histological examination of early bone apposition around zirconia dental implants at 2 and 4 weeks after insertion was compared to that of surface-modified titanium implants. There was no difference in osseointegration between acid-etched zirconia implants and acid-etched titanium implants. ,, This was true even when the implant surfaces were pharmacologically and chemically modified  [Table 2]. It can be concluded that the removal of torque value of zirconia implants was improved after surface modification, but was not more than that of titanium implants. Limited amount of research on zirconia proves that zirconia is biocompatible with the surrounding tissues. Compared to titanium, its osseointegration is inferior and shows improvement after surface modification. Strength of zirconia is good, but comparatively lesser than that of titanium. Zirconia is osseoconductive as reported in some studies and has also shown favourable interaction with the soft tissue. It has been found that zirconia reduces plaque formation on the implant surface, which leads to good healing and successful implant treatment. Most of the studies on zirconia implants are short-term studies and evidence of success in long-term clinical trials is lacking. More research is needed on zirconia dental implants before we could use it for frequent treatment needs, as compared to titanium implants. Kuboki T, Okamoto S, Suzuki H, Kanyama M, Arakawa H, Sonoyama W, et al. Quality of life assessment of bone-anchored fixed partial denture patients with unilateral mandibular distal-extension edentulism. J Prosthet Dent 1999;82:182-7. Depprich R, Zipprich H, Ommerborn M, Naujoks C, Wiesmann HP, Kiattavorncharoen S, et al. Osseointegration of zirconia implants compared with titanium: An in vivo study. Head Face Med 2008;4:30. Steinemann SG. Titanium-the material of choice? Periodontol 2000 1998;17:7-21. Heydecke G, Kohal R, Gläser R. Optimal esthetics in single-tooth replacement with the Re-Implant system: A case report. Int J Prosthodont 1999;12:184-9. Tschernitschek H, Borchers L, Geurtsen W. Nonalloyed titanium as a bioinert metal-A review. Quintessence Int 2005;36:523-30. Sterner T, Schütze N, Saxler G, Jakob F, Rader CP. Effects of clinically relevant alumina ceramic, zirconia ceramic and titanium particles of different sizes and concentrations on TNF-alpha release in a human macrophage cell line. Biomed Tech (Berl) 2004;49:340-4. Akagawa Y, Ichikawa Y, Nikai H, Tsuru H. Interface histology of unloaded and early loaded partially stabilized zirconia endosseous implant in initial bone healing. J Prosthet Dent 1993;69:599-604. Scarano A, Di Carlo F, Quaranta M, Piattelli A. Bone response to zirconia ceramic implants: An experimental study in rabbits. J Oral Implantol 2003;29:8-12. Kohal RJ, Weng D, Bächle M, Strub JR. Loaded custom-made zirconia and titanium implants show similar osseointegration: An animal experiment. J Periodontol 2004;75:1262-8. Ahmad I. Yttrium-partially stabilized zirconium dioxide posts: An approach to restoring coronally compromised nonvital teeth. Int J Periodontics Restorative Dent 1998;18:455-65. Jackson MC. Restoration of posterior implants using a new ceramic material. J Dent Technol 1999;16:19-22. Pekkan G, Pekkan K, Hatipoglu MG, Tuna SH. Comparative radiopacity of ceramics and metals with human and bovine dental tissues. J Prosthet Dent 2011;106:109-17. Rimondini L, Cerroni L, Carrassi A, Torricelli P. Bacterial colonization of zirconia ceramic surfaces: An in vitro and in vivo study. Int J Oral Maxillofac Implants 2002;17:793-8. Denry I, Kelly JR. State of the art of zirconia for dental applications. Dent Mater 2008;24:299-307. Piconi C, Maccauro G. Zirconia as a ceramic biomaterial. Biomaterials 1999;20:1-25. Chai J, Chu FC, Chow TW, Liang BM. Chemical solubility and flexural strength of Zirconia- based ceramics. Int J Proshodont 2007;20:587-95. Yilmaz H, Aydin C, Gul BE. Flexural strength and fracture toughness of dental core ceramics. J Prosthet Dent 2007;98:120-8. Qeblawi DM, Muñoz CA, Brewer JD, Monaco EA Jr. The effect of zirconia surface treatment on flexural strength and shear bond strength to a resin cement. J Prosthet Dent 2010;103:210-20. Minamizato T. Slip-cast zirconia dental roots with tunnels drilled by laser process. J Prosthet Dent 1990;63:677-84. Kohal RJ, Klaus G, Strub JR. Zirconia-implant supported all-ceramic crowns withstand long-term load: A pilot investigation. Clin Oral Implants Res 2006;17:565-71. Kohal RJ, Finke HC, Klaus G. Stability of prototype two-piece zirconia and titanium implants after artificial aging: An in vitro pilot study. Clin Implant Dent Relat Res 2009;11:323-9. Kohal RJ, Wolkewitz M, Tsakona A. The effects of cyclic loading and preparation on the fracture strength of zirconium-dioxide implants: An in vitro investigation. Clin Oral Implants Res 2011;22:808-14. Silva NR, Coelho PG, Fernandes CA, Navarro JM, Dias RA, Thompson VP. Reliability of one-piece ceramic implant. J Biomed Mater Res B Appl Biomater 2009;88:419-26. Chevalier J, Gremillard L, Virkar AV, Clarke DR. The tetragonal-monoclinic transformation in zirconia: Lessons learned and future trends. J Am Ceram Soc 2009;92:1901-20. Suresh A, Mayo MJ, Porter WD, Rawn CJ. Crystallite and grain-size-dependent phase transformations in Yttria-Doped zirconia. J Am Ceram Soc 2003;86:360-2. Garvie RC, Hannink RH, Pascoe RT. Ceramic steel? Nature 1975;258:703-4. Sato T, Shimada M. Transformation of Yttria-Doped tetragonal ZrO2 polycrystals by annealing in water. J Am Ceram Soc 1985;68:356-9. Swab JJ. Low temperature degradation of Y-TZP materials. J Mater Sci 1991;26:6706-14. Chevalier J. What future for zirconia as a biomaterial? Biomaterials 2006;27:535-43. Deville S, Chevalier J, Gremillard L. Influence of surface finish and residual stresses on the ageing sensitivity of biomedical grade zirconia. Biomaterials 2000;27:2186-92. Watanabe M, Iio S, Fukuura I. Ageing behaviour of Y-TZP. In: Claussen N, Ruhle M, Heuer AH, editors. Science and Technology of Zirconia II (Advances in Ceramics) Vol. 12. Columbus, OH, USA: The American Ceramic Society; 1984. p. 391-8. Att W, Grigoriadou M, Strub JR. ZrO2 three-unit fixed partial dentures: Comparison of failure load before and after exposure to a mastication simulator. J Oral Rehabil 2007;34:282-90. Zechner W, Tangl S, Fürst G, Tepper G, Thams U, Mailath G, et al. Osseous healing characteristics of three different implant types. Clin Oral Implants Res 2003;14:150-7. Albrektsson T, Wennerberg A. Oral implant surfaces: Part 2--Review focusing on clinical knowledge of different surfaces. Int J Prosthodont 2004;17:544-64. Sollazzo V, Pezzetti F, Scarano A, Piattelli A, Bignozzi CA, Massari L, et al. Zirconium oxide coating improves implant osseointegration in vivo. Dent Mater 2008;24:357-61. Franchi M, Bacchelli B, Martini D, Pasquale VD, Orsini E, Ottani V, et al. Early detachment of titanium particles from various different surfaces of endosseous dental implants. Biomaterials 2004;25:2239-46. Akagawa Y, Hosokawa R, Sato Y, Kamayama K. Comparison between freestanding and tooth-connected partially stabilized zirconia implants after two years' function in monkeys: A clinical and histologic study. J Prosthet Dent 1998;80:551-8. Stadlinger B, Hennig M, Eckelt U, Kuhlisch E, Mai R. Comparison of zirconia and titanium implants after a short healing period. A pilot study in minipigs. Int J Oral Maxillofac Surg 2010;39:585-92. Dubruille JH, Viguier E, Le Naour G, Dubruille MT, Auriol M, Le Charpentier Y. Evaluation of combinations of titanium, zirconia, and alumina implants with 2 bone fillers in the dog. Int J Oral Maxillofac Implants 1999;14:271-7. Schultze-Mosgau S, Schliephake H, Radespiel-Tröger M, Neukam FW. Osseointegration of endodontic endosseous cones: Zirconium oxide vs titanium. Oral Surg Oral Med Oral Pathol Oral Radiol Endod 2000;89:91-8. Kohal RJ, Papavasiliou G, Kamposiora P, Tripodakis A, Strub JR. Three-dimensional computerized stress analysis of commercially pure titanium and yttrium-partially stabilized zirconia implants. Int J Prosthodont 2002;15:189-94. Hoffmann O, Angelov N, Gallez F, Jung RE, Weber FE. The zirconia implant-bone interface: A preliminary histologic evaluation in rabbits. Int J Oral Maxillofac Implants 2008;23:691-5. Depprich R, Zipprich H, Ommerborn M, Mahn E, Lammers L, Handschel J, et al. Osseointegration of zirconia implants: An SEM observation of the bone-implant interface. Head Face Med 2008;4:25. Gahlert M, Röhling S, Wieland M, Sprecher CM, Kniha H, Milz S. Osseointegration of zirconia and titanium dental implants: A histological andhistomorphometrical study in the maxilla of pigs. Clin Oral Implants Res 2009;20:1247-53. Gahlert M, Roehling S, Sprecher CM, Kniha H, Milz S, Bormann K. In vivo performance of zirconia and titanium implants: A histomorphometric study in mini pig maxillae. Clin Oral Implants Res 2012;23:281-6. Langhoff JD, Voelter K, Scharnweber D, Schnabelrauch M, Schlottig F, Hefti T, et al. Comparison of chemically and pharmaceutically modified titanium and zirconia implant surfaces in dentistry: A study in sheep. Int J Oral Maxillofac Surg 2008;37:1125-32. Özkurt Z, Kazazoðlu E. Zirconia dental implants: A literature review. J Oral Implantol 2011;37:367-76. Bächle M, Butz F, Hübner U, Bakalinis E, Kohal RJ. Behavior of CAL72 osteoblast-like cells cultured on zirconia ceramics with different surface topographies. Clin Oral Implants Res 2007;18:53-9. Gahlert M, Gudehus T, Eichhorn S, Steinhauser E, Kniha H, Erhardt W. Biomechanical and histomorphometric comparison between zirconia implants with varying surface textures and a titanium implant in the maxilla of miniature pigs. Clin Oral Implants Res 2007;18:662-8. Hoffmann O, Angelov N, Zafiropoulos GG, Andreana S. Osseointegration of zirconia implants with different surface characteristics: An evaluation in rabbits. Int J Oral Maxillofac Implants 2012;27:352-8. Stübinger S, Homann F, Etter C, Miskiewicz M, Wieland M, Sader R. Effect of Er: YAG, CO (2) and diode laser irradiation on surface properties of zirconia endosseous dental implants. Lasers Surg Med 2008;40:223-8. Klokkevold PR, Nishimura RD, Adachi M, Caputo A. Osseointegration enhanced by chemical etching of the titanium surface. A torque removal study in the rabbit. Clin Oral Implants Res 1997;8:442-7. Sennerby L, Dasmah A, Larsson B, Iverhed M. Bone tissue responses to surface-modified zirconia implants: A histomorphometric and removal torque study in the rabbit. Clin Implant Dent Relat Res 2005;7(Suppl 1):S13-20. Alzubaydi TL, Alameer SS, Ismaeel T, Alhijazi AY, Geetha M. In vivo studies of the ceramic coated titanium alloy for enhanced osseointegration in dental applications. J Mater Sci Mater Med 2009;20(Suppl 1):S35-42. Ferguson SJ, Langhoff JD, Voelter K, von Rechenberg B, Scharnweber D, Bierbaum S, et al. Biomechanical comparison of different surface modifications for dental implants. Int J Oral Maxillofac Implants 2008;23:1037-46. Josset Y, Oum'Hamed Z, Zarrinpour A, Lorenzato M, Adnet JJ, Laurent-Maquin D. In vitro reactions of human osteoblasts in culture with zirconia and alumina ceramics. J Biomed Mater Res 1999;47:481-93. Torricelli P, Verné E, Brovarone CV, Appendino P, Rustichelli F, Krajewski A, et al. Biological glass coating on ceramic materials: In vitro evaluation using primary osteoblast cultures from healthy and osteopenic rat bone. Biomaterials 2001;22:2535-43. Lohmann CH, Dean DD, Köster G, Casasola D, Buchhorn GH, Fink U, et al. Ceramic and PMMA particles differentially affect osteoblast phenotype. Biomaterials 2002;23:1855-63. Liagre B, Moalic S, Vergne P, Charissoux JL, Bernache- Assollant D, Beneytout JL. Effects of alumina and zirconium dioxide particles on arachidonic acid metabolism and proinflammatory interleukin production in osteoarthritis and rheumatoid synovial cells. J Bone Joint Surg Br 2002;84:920-30. Ito A, Tateishi T, Niwa S, Tange S. In vitro evaluation of the cytocompatibility of wear particles generated by UHMWPE/zirconia friction. Clin Mater 1993;12:203-9. Christel P, Meunier A, Heller M, Torre JP, Peille CN. Mechanical properties and short-term in-vivo evaluation of yttrium-oxide-partially-stabilized zirconia. J Biomed Mater Res 1989;23:45-61. Ichikawa Y, Akagawa Y, Nikai H, Tsuru H. Tissue compatibility and stability of a new zirconia ceramic in vivo. J Prosthet Dent 1992;68:322-6. Styles JA, Wilson J. Comparison between in vitro toxicity of two novel fibrous mineral dusts and their tissue reaction in vivo. Ann Occup Hyg 1976;19:63-8. Helmer JC, Driskell TD. Research on Bioceramics: Symposium on Use of Ceramics as Surgical Implants. South Carolina: Clemson University; 1969. Wagner W, Rixecker H, Wahlmann UW. Morphometric comparison of histologic bone reactions after implantation of mono- and polycrystalline aluminium oxide pins. In: Christel P, Meunier A, Lee AJ, editors. Biological and Biomechanical Performance of Biomaterials. Amsterdam: Elsevier; 1986. p. 129-34. Christel PS. Zirconia: The second generation of ceramics for total hip replacement. Bull Hosp Jt Dis Orthop Inst 1989;49:170-7. Kohal RJ, Bächle M, Att W, Chaar S, Altmann B, Renz A, et al. Osteoblast and bone tissue response to surface modified zirconia and titanium implant materials. Dent Mater 2013;29:763-76. 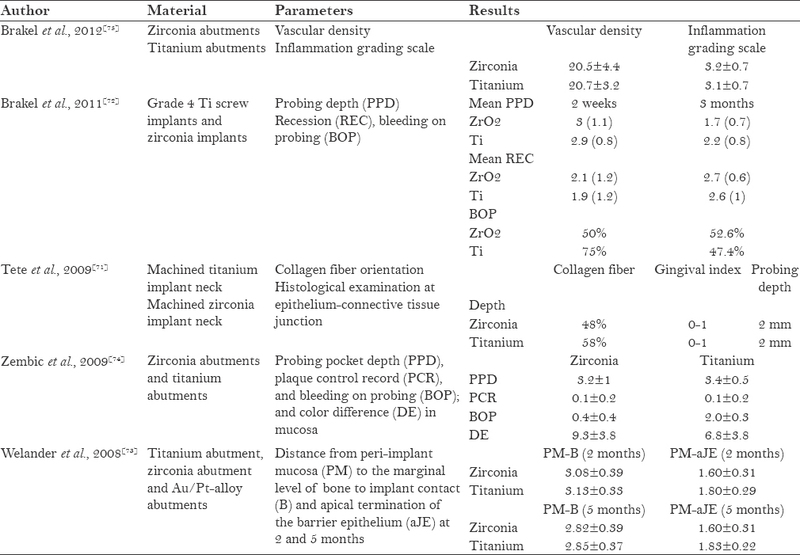 Gredes T, Kubasiewicz-Ross P, Gedrange T, Dominiak M, Kunert-Keil C. Comparison of surface modified zirconia implants with commercially available zirconium and titanium implants: A histological study in pigs. Implant Dent 2014;23:502-7. Tetè S, Mastrangelo F, Bianchi A, Zizzari V, Scarano A. Collagen fiber orientation around machined titanium and zirconia dental implant necks: An animal study. Int J Oral Maxillofac Implants 2009;24:52-8.
van Brakel R, Cune MS, van Winkelhoff AJ, de Putter C, Verhoeven JW, van der Reijden W. Early bacterial colonization and soft tissue health around zirconia and titanium abutments: An in vivo study in man. Clin Oral Implants Res 2011;22:571-7. Welander M, Abrahamsson I, Berglundh T. The mucosal barrier at implant abutments of different materials. Clin Oral Implants Res 2008;19:635-41. Zembic A, Sailer I, Jung RE, Hämmerle CH. Randomized-controlled clinical trial of customized zirconia and titanium implant abutments for single-tooth implants in canine and posterior regions: 3-year results. Clin Oral Implants Res 2009;20:802-8.
van Brakel R, Meijer GJ, Verhoeven JW, Jansen J, de Putter C, Cune MS. Soft tissue response to zirconia and titanium implant abutments: An in vivo within-subject comparison. J Clin Periodontol 2012;39:995-1001. Ong ES, Newman HN, Wilson M, Bulman JS. The occurrence of periodontitis-related microorganisms in relation to titanium implants. J Periodontol 1992;63:200-5. Scarano A, Piattelli M, Caputi S, Favero GA, Piattelli A. Bacterial adhesion on commercially pure titanium and zirconium oxide disks: An in vivo human study. J Periodontol 2004;75:292-6. Egawa M, Miura T, Kato T, Saito A, Yoshinari M. In vitro adherence of periodontopathic bacteria to zirconia and titanium surfaces. Dent Mater J 2013;32:101-6. Re D, Pellegrini G, Francinetti P, Augusti D, Rasperini G. In vivo early plaque formation on zirconia and feldspathic ceramic. Minerva Stomatol 2011;60:339-48.